“The Entertainer” (1902), Scott Joplin. “Magnetic Rag” (“Syncopations Classique,” 1914), Scott Joplin. “Stoptime Rag” (1910), Scott Joplin. “Rose Leaf Rag” (1907), Scott Joplin. “Contentment” (1915), Joseph F. Lamb. “Pleasant Moments” (ragtime waltz, 1909), Scott Joplin. “Frog Legs Rag” (1906), James Scott. “Elite Syncopations” (1902), Scott Joplin. “Bohemia Rag” (1915), Joseph F. Lamb. “Dixie Dimples” (novelty foxtrot, 1918), James Scott. The Sycamore: A Concert Rag (1904), Scott Joplin. “A Breeze from Alabama” (1902), Scott Joplin. “The Rosebud March” (1905), Scott Joplin. “Prosperity Rag” (1916), James Scott. “The Easy Winners” (1901), Scott Joplin. “Search-Light” (rag, 1907), Scott Joplin. “The Strenuous Life” (1902), Scott Joplin. “Maple Leaf Rag” (1899), Scott Joplin. even exceeds that of the New England Conservatory Ragtime Ensemble of old. With this 72 minute disc, the PRO pays rousing tribute to the “classic” rags of Scott Joplin and his disciples Joseph F. Lamb, Arthur Marshall, and James Scott. Included are favorites like the “Maple Leaf Rag” and “The Entertainer,” along with the world premiere recordings of seven original early 1900s orchestrations which were only recently discovered. Complimenting the music is a whimsical 12-page, full color booklet created by the noted artist and ragtime scholar Chris Ware. A trove of rare photos, period illustrations, and score excerpts, this booklet reveals fascinating new information on Scott Joplin based on recent, cutting-edge research. Beautifully played and handsomely recorded, this CD is a highlight of Paragon’s distinguished 26-year career as leading performers of Scott Joplin’s music. 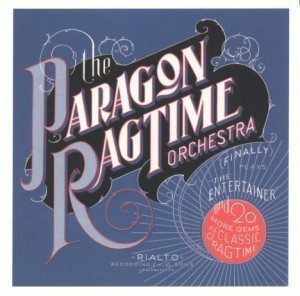 Recorded in the legendary 1857 Mechanics Hall, this is a genuine “must have” disc for both the casual listener and the seasoned ragtime enthusiast. "Four Stars...The music is incomparably sweet and stirring. And Rick Benjamin, who founded and conducts the PRO, is a musician of wit and sensibility."